Velesto Energy Berhad, previously known as UMW Oil & Gas Corp Bhd, is a multinational provider of drilling and oilfield services for the upstream sector of the oil and gas industry. The company's line of products and services include drilling and workover services for exploration, development, and production of wells in Malaysia and southeast Asia through several offshore drilling rigs and hydraulic workover units. Under the oilfield services segment, the company offers threading, inspection, and repair services for Oil Country Tubular Goods in various offshore markets. Operating revenue is primarily derived from drilling services, which includes ownership and operation of several drilling rigs and hydraulic workover units, or HWUs. Rigs and HWUs are chartered through day-rate-based contracts. dusti Suspect many have bought from a con-sifu. Think carefully! Woodswater ramada If gain 3% per day, it's very good. 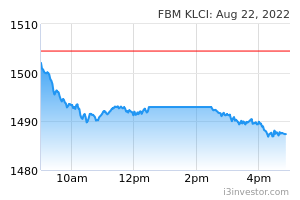 But for this sapulah, total shares as much as 16 billion. No way. 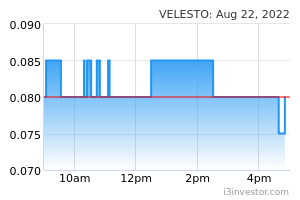 How much total shares of velesto up to dates ? Good sign of sister corpo of PNB awarded contract , soon will b velesto ‘ turn. Neck very long can challenge ziraff Liao . shahbj Thats y..QR only release in may..lets dump vele n buy others first..early may we buy back vele..
offshore People are buying 1 lot simply because this company gave door gifts and vouchers worth up to RM50 in the past. So if you buy 1 lot, you can recover all your capital by just attending one AGM. The AGM should be somewhere in May so it's time to buy now. Tian Sen Tester Where will the meeting be held ya? sooaria Calvin - Why vele strong Velesto , due to the huge volume. ? Airline Bobby Relax lol .Wait for the contracts to be announced. Rumor say Saudi will increased output avoid their market shares overtaken by US shale oil verified fake!